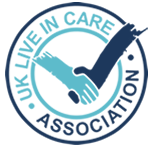 Palliative Live In care | 24 hour end of life care in your own home. End-of-Life care is a very special service because it is the final service we can offer to you. It is almost impossible to fully explain the benefits of our high quality end-of-life care on a single web page, so please call us on 0333 355 3126 or email us on admin@lovingangelscare.uk and we’ll call you. What our end-of-life care involves depends completely on you: it might be a simple comfort care or it might extend through to palliative care of painful illnesses. End-of-life care is built around people who are approaching the end of their lives but it also includes their family or carers in the process. The aim of this service is to help you to live as comfortably as possible in your final moments. Out end-of-life care may include pure palliative care which makes you as comfortable as possible by relieving pain or distress, while providing you, your family and your carers with psychological, social and spiritual support. If you think end-of-life care is a service you would like to discuss please call us now on 0333 355 3126.